Eighteen crisp vanilla fortune cookies are immersed in fine Belgian chocolate and sprinkled with delicate candy hearts in pink red and white. Each cookie contains a thoughtful message or fortune about love, life and happiness. Presented in a red enamel tin, its a sweet, romantic gesture for Valentine's Day. Eighteen Vanilla Fortune Cookies Dipped in Fine Belgian Chocolate. Hand Decorated with Royal Icing Heart Sprinkles. Each cookie contains a fortune or thoughtful message. 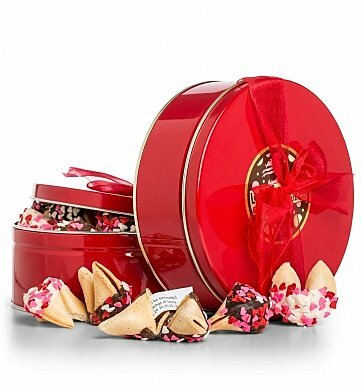 Each premium fortune cookie is wrapped in French cellophane for freshness, nestled safely in a red enamel tin, and accentuated with a hand-tied ribbon. Valentine's Day Tin of Fortunes is a hand delivered gift. These gifts are delivered by one of our local design centers located throughout the United States and Canada. Same day delivery is available for most gifts when ordered before the cutoff time. The cutoff time for Valentine's Day Tin of Fortunes is in the recipient's time zone. Show your Valentine just how "fortune-ate" you are to have them in your life, with this collection of romantic chocolate-dipped fortune cookies.